Last week we had the "AboutNOWish" team come in to perform their interactive sound and movement piece "Underfoot" at Threeways. They took over the Sensory Studio for three days and worked with several students and I can not praise their work highly enough. Not only were the students inspired and very obviously joyfully engaged, but the staff too. Since the departure of the team the school has been buzzing with people collaborating to build on that creative energy and replicate some of the fantastic work that went on. The piece made use of 3 large pieces of layered textural matting (grass, pink squashy matts and blue fluff), 3 dancers, a musician/technician, some underfloor bespoke pressure sensors and custom built software (made in Supercollider). Each texture had its own sound/music and movements and between each the flooring was rolled back to reveal the next layer. The dancers used intensive interaction techniques with plenty of individual attention and eye/body contact to encourage the students to join in with the movements, no talking was used. The students responded magnificently, even some with quite challenging behaviour, and were obviously very engaged. The musician/technician supported with large whistle and saxophone accompanied by a subtle electronic soundtrack managed by the software and a discrete controller. 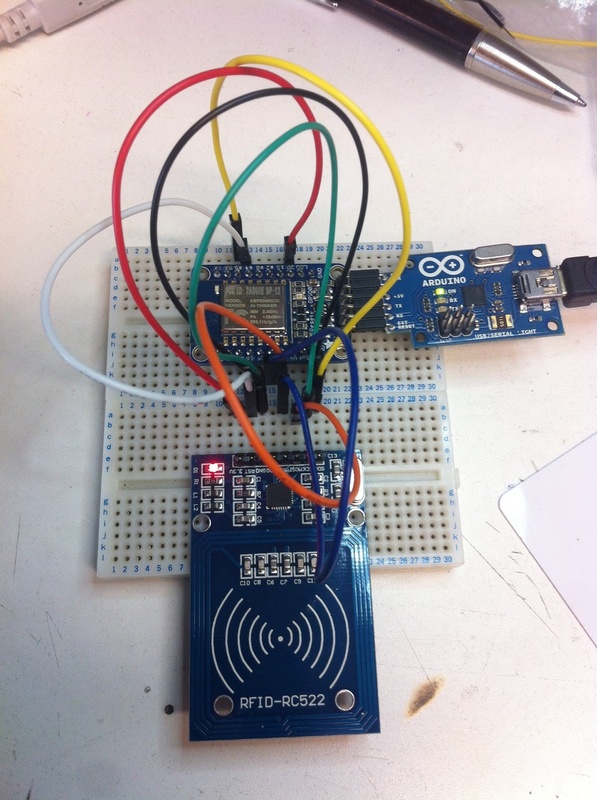 Some electronic sounds triggered by the sensors provided a nice random element to the sound too. The instrument playing also became part of the performance as the musician moved onto the mat and interacted with students and did a very good job of playing with a child's arm down the front of the saxophone on several occasions. This type of use of resonant surfaces for tactile sensations often has a great effect on several of our students. The technology employed was inspired in its subtlety, effectiveness and flexibility. Although the sensors provided a great element to the piece, the students were mostly unaware of their existence. The electronic music was subtle and provided a great backing, mood and depth for the live playing that was going on and I felt that had the technology crashed then the piece could have still carried on without major issue. The team seemed well practiced in getting in and out of installations and the kit seems robust and quick to set up. For its use at Threeways in the Studio we decided to patch it into the lighting so that the pressure sensors could also control spots of light over the sensors which was nice to explore. The team were a lovely bunch of people and very sensitive to the needs of the school, I would highly recommend this performance and indeed we hope to find another opportunity to work with them again. We have received many testimonials from staff and parents as to the effectiveness of the sessions. eTextile quick demo from Luke Woodbury on Vimeo. Today at Threeways School we met with some Bath Spa University art students to discuss a project that looks to explore eTextiles. We will be working towards an installation that will be explored by the children and young people at Threeways in the Sensory Studio in March. 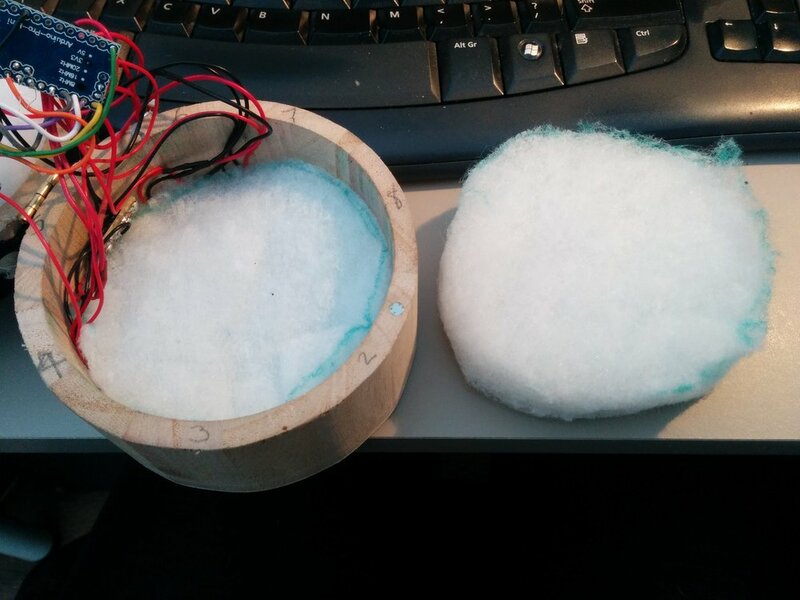 I wanted to rig up a demo that made use of conductive thread and a micro controller designed for wearable projects so I ordered an Adafruit Gemma (essentially a wearable Arduino) and some sewable Neopixels and went on the fantastic Adafruit website to look at the wearable projects for inspiration. The parts were assembled between rectangles of the cushion foam with the LEDs stitched into the middle layer. The piezo element was covered in electrical tape to stop the metal touching the conductive thread (remember it is pretty much like bare wire so don't let it touch things it shouldn't! ), and layered underneath the battery and Gemma board. The final assembly was then put into a little cotton bag. I made sure to use crocodile clip test leads to check the hardware before I wired it up for real and tested each component as it was sewn in. The thread I used really needed clear nail varnish painting on the knots as soon as you have tied it off to stop them coming undone, but the one I have linked above says it is rough so ties up better. You could also stuff the bag with something smelly and maybe a vibration motor for a true multi sensory experience! pixels.show();                //Set all pixels to "off"
We need to tread the line with offering the user control over the creative process, whilst enabling the orchestra as a whole to play cohesively - the real challenge! We have been looking at a couple of initial ideas for development in terms of the outer casing of the instruments and the inner gubbins that make it work. They are the ‘filter box’ and the ‘pressure box’. 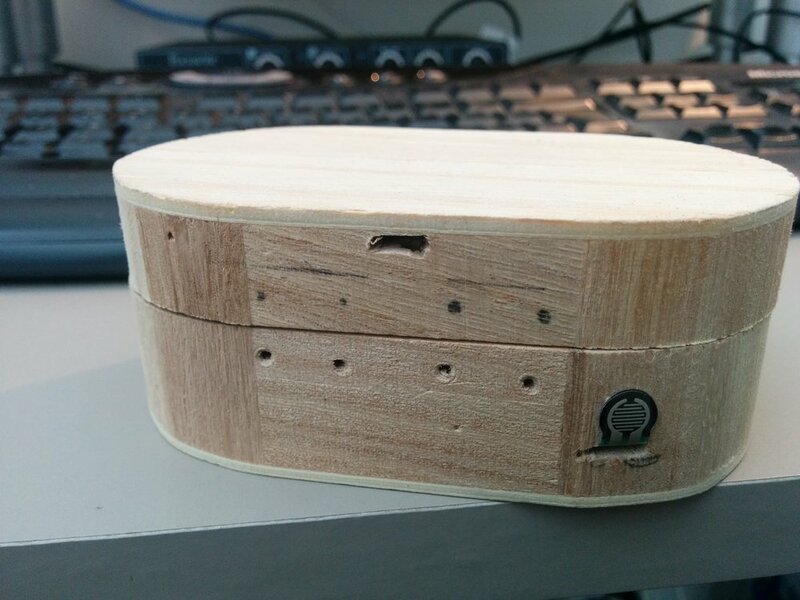 A box that can sense how much it is open and link to a filter in an electronic instrument. LDR (light dependent resistor) on the inside so that as the lid is opened, the amount of light hitting the sensor changes the filter, this is a affordable option as this component is cheap to purchase but the problem comes when trying to calibrate the sensor as ambient light levels can change during a performance and in different environments. Flex sensor against the inside of the lid so that as the lid is closed the flex sensor is compressed. Flex sensors cost around £7 each so not as affordable as the LDR but does not have to be calibrated as they should always give the same reading. Homemade flex sensors can be made extremely cheaply as seen in this instructable, we have some ready made from a previous project that we will trial in this instrument which follow a similar set-up but use anti-static foam at the centre. Stretch sensor attached between the bottom and the lid of the box, this would give readings when stretched open and could be used as a nice string to pull the lid closed to give tactile feedback. Magnet on the lid and hall effect sensor inside so that as the magnet moves away the sensor returns to the base value. 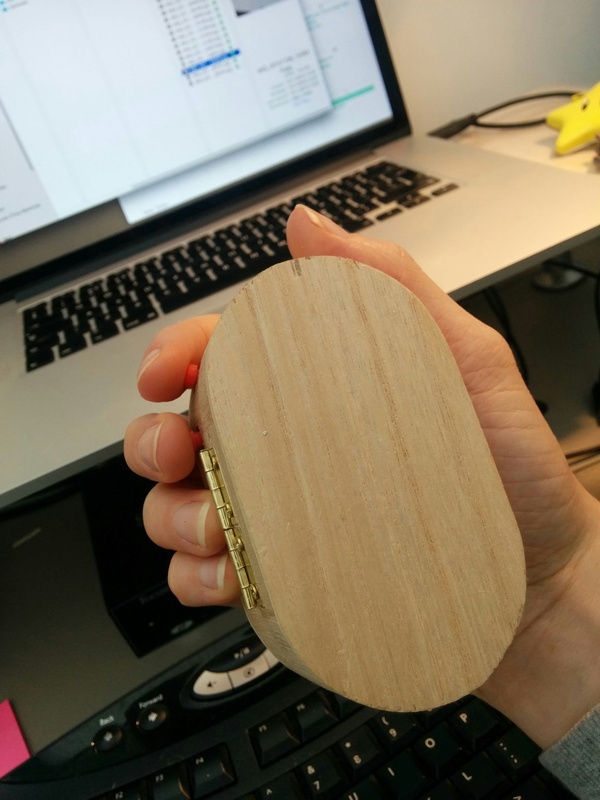 We will have to do some small prototypes to figure out the cheapest and best way to create this box! We will be developing and testing from these initial ideas and will connect those blog posts related to that to here so you can keep up to date with the progress on these new instruments for musical expression! This week saw an art installation in the Sensory Studio at Threeways School. This was a collaboration between degree art students at Bath Spa University and Threeways secondary students under Lucy Knibb's direction. We helped with the formation and installation of the piece and added a few electronics and lighting. We also used the surround speaker and projection system in the studio to rotate some audio recordings and visuals of the creation of the piece. This was a great project to be part of and the students involved were rightly very proud of the outcome. At Threeways we made a vibrotactile loop that can be activated using an on-board switch or an external switch plugged in through a Jack port in the device. Pressing the button to activates the vibration which is provided by a motor housed in a synthetic rubber and PVC repurposed from a massage tube. We had this tube spare after using the caps from it to fix 2 other massage tubes and thought it would be a shame to waste it, so the vibrotactile loop was born. This packs quite a punch and is a great tactile sensory tool. Cool components big button. LED that came with the button. A 1/4 inch audio socket. A 3v regulator. A 9V battery clip with 9V battery, some wire and a piece of strip-board to connect it all up. When using the 3v regulator be careful to check which pins are which before connecting. The motor requires 3v and the LED 12v so we used, as an in-between, a 9v battery with a regulator to allow 3v to go to the motor and the 9v to go straight to the LED. Threeways purchased a Musii a little while back now and have had some great sessions with it. It has 3 inflatable prongs with built in distance sensors and LED lighting and makes musical sounds as you press them in. The software runs on a little built in Linux machine and it is all self contained with an amp and speaker inside meaning it also vibrates. I always find that sound needs to be local like this for a meaningful experience, rather than coming out of a speaker over there on a wall which can be a little abstract. Since we have had the unit it has been updated to make the sounds less discordant which has helped, but the only other issue we have had is access. Wheelchairs can not get very close to it, but the company are very open to critique and they are apparently looking at something more lap based. Personally, I'd love these to be coming directly out of the floor or the wall!